The evolution of transit systems in San Francisco, from the settlement by the Spanish to the metropolis of the late nineteenth century, traces its roots in competitive entrepreneurial enterprise. From horse-drawn omnibuses to rail transit services to cable cars to electric trolleybuses and their champions, the rise and decline and consolidation of these systems is described to explain the history of San Francisco's complex network of transportation. In its earliest years, transit systems in San Francisco were an entrepreneurial product, either of those who sought an attractive direct return from the operation of a service, or of those who owned land and wanted to enhance the accessibility, and hence value, of their holdings. There was no overall system to speak of, and under conditions of relatively free market entry, many small, privately-operated, competing transit companies, some operating but a single route, were formed. The Yellow Line -- the first omnibus line -- starts service between Kearny & Clay (at Portsmouth Square) and Mission Dolores. The line had 30-minute headway, with a fare of 50 cents Monday through Saturday and $1.00 on Sunday ... Later, the company established other routes, and the Red Line began competition, causing fares to fall to 10 cents. The success of these first services led to a considerable expansion. In his Report, discussed below, Bion Arnold noted that service was in operation to the Presidio by the mid-1850s, and that a five-minute headway was operated between South Park and North Beach over what we now know as the 15 line. An extensive collection of horse omnibus routes was running by the time of the Civil War. Within a decade rail transit service entered the picture, and it is interesting to contemplate that San Francisco's rail transit history is as long or longer than that of other major world cities. The horse car, rail-borne version of the omnibus, developed in America, perhaps because of more primitive road conditions, or perhaps, in part, because of greater distances. Precursors in New York date from 1832 and New Orleans from 1835, but widespread adoption in Eastern cities came only in the 1850s. (see George Hilton, The Cable Car in America, 1971). In Paris, where this technology was known as Le Chemin de Fer Américain, the first commercially operated line was established, with equipment built in New York, in 1854. (see Marc Gaillard, Histoire des Transports Parisiens, 1988). London did not have its first American-style tramway until the Bayswater Road line opened on March 23, 1861 (with Dickens and Thackeray present, see R.W. Kidner, The London Tramcar 1861-1952). But by the time sophisticated Londoners embraced the horse car, it was already old hat in San Francisco. In 1857, a franchise was granted to Thomas Hayes and associates, who owned suburban tracts of land in what is still known as Hayes Valley, to connect this area with the heart of the city. Using this franchise, the San Francisco Market Street Railroad Company graded the right of way through the sand dunes, laid track, and began operation with steam and horse power on the Fourth of July 1860. 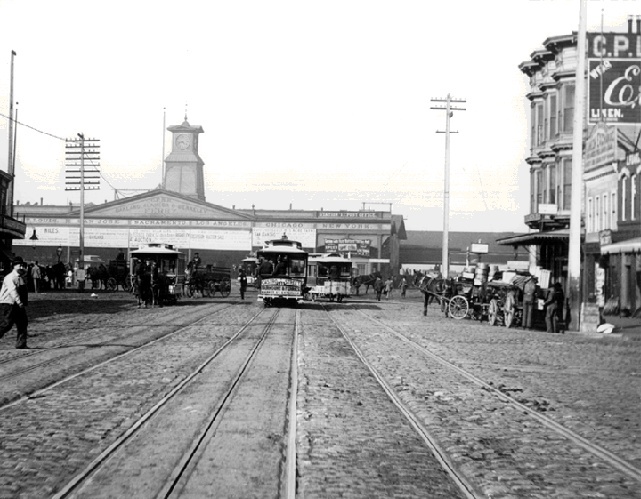 The original line ran out Market Street from Third Street, then via Valencia Street to 16th. The following year, the Hayes Street branch began running out to Laguna Street, beginning what is now well over a century of public service by the 21-Hayes line, served today by efficient electric trolleybuses. Horsecar #14 pauses at Post and Market on its way to Woodward's Gardens, c. 1860s. If streets and avenues are the city's arteries and veins, the horse car is the most vital corpuscle that circulates through them. Indeed, without the horse car the business and social circulation in the outer portions would diminish to positive stagnation, if it did not wholly cease. But for the horse car, the population would pack itself into an unhealthful density in and about all those quarters most devoted to manufacture, trade and leading occupations, and large cities would presently suffer from a social or civic congestion of the heart. It is hardly too much to say that the modern horse car is among the most indispensable conditions of modern metropolitan growth. It is to a city what steam-cars and steamship lines are to a State or Country. Notwithstanding this paean to the horse car, the mode had obvious limitations and defects, including unpleasant and unhealthful pollution of city streets in crowded areas. Not the least of the operating problems for the industry was susceptibility to equine diseases, most strikingly seen in the Great Epizootic of 1872, a form of equine influenza which killed many thousands of animals nationwide. Before about 1890, there was no really practical form of electric propulsion for transit use, and therefore the use of mechanically transmitted steam power remained a management objective. In places, steam dummies, small steam locomotives, sometimes enclosed or semi-enclosed, and designed for urban transit, were used to pull transit coaches. This technique was most often used in outlying districts where grades were more permissive, and smoke and soot were less likely to prove themselves a significant public annoyance. The Ferries and Cliff House Railway, for example, operated an extension of the Powell Street cable system from Central (now Presidio) Avenue out California Street and around Lands End to the Cliff House; a branch ran from California Street down Seventh Avenue to Golden Gate Park, where its station building still stands on the south side of Fulton Street. Geary Boulevard and Lincoln Way were similarly served by steam operated lines. But the most successful mechanical application of steam power to transit operation, and, of course, the arch-typical San Francisco transit mode, was the cable car. Although there were precursors, the first effective use of steam-powered cable traction for transit purposes was the Clay Street Hill Railroad Company. Andrew Hallidie, a London-born Scottish immigrant engaged in the manufacture of wire cables in a North Beach factory, perfected the application of mining-industry technology to street railway operation. Interesting a small group of financial backers, his system went into operation on the storied morning of August 1, 1873, with Hallidie personally and heroically at the grip of the first test car on its steep run between Jones and Kearny Streets. The success of this installation led to a spread of this technology to many other cities, in the United States and abroad. 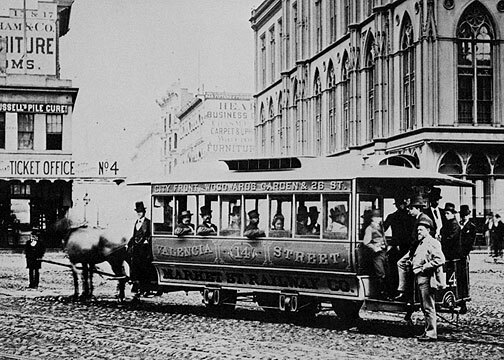 In San Francisco, some of the established horse car companies, such as the Omnibus and Sutter Street Railroads, converted their mainlines to cable operation, and other new companies were formed to build new systems, such as the California Street and Geary Street lines, and the mighty Market Street network. There are beaches in other places, indeed, but there is no other Carville-by-the-Sea. This capricious suburb, founded upon the shifting sands of the Great Highway, as San Francisco's ocean boulevard is named, is a little, freakish hamlet, whose dwellings -- one could not seriously call them houses -- are built, for the most part, of old street-cars. The architecture is of a new order, frivolously inconsequent. According to the owner's fancy, the cars are placed side by side or one atop the other, arranged every way, in fact, except actually standing on end. From single cars, more or less adapted for temporary occupancy, to whimsical residences, in which the car appears only as rudimentary fragments, a suppressed motif suggested by rows of windows or by sliding doors, the owner's taste and originality have had wanton range. Balconies jut from roofs, piazzas enclose sides and fronts, cars are welded together, dovetailed, mortised, added as ells at right angles or used terminally as kitchens to otherwise normal habitations. Gay P. Summer was, with his room-mate, the proprietor of a car of the more modest breed. It was a weather-worn, blistered, orange-colored affair that had once done service on Mission Street. The cash-box was still affixed to the interior, the platform, shaky as it was, still held; the gong above, though cracked, still rang. There was a partition dividing what they called their living-room, where the seats did service for bunks, from the kitchen, where they were bridged for a table and perforated for cupboards. There was a shaky canvas arrangement over a plank platform; and beneath, in the sand, was buried a treasure of beer bottles, iron knives, and forks and spoons and wooden plates. Here, unchaperoned and unmolested, save by the wind and sun, Gay P. Summer and Fancy Gray proceeded to get acquainted. They made short work of it. After 1890, electric streetcars became practical on most grades. San Francisco's first such line was yet another independent: the San Francisco and San Mateo Railroad Company, occupying a route from the Ferry Building via Steuart, Harrison, Fourteenth and Guerrero Streets and San Jose Avenue. A branch was built over Eighteenth Street and the Upper Market switchback (today a feature of the 33-Stanyan trolleybus line) to Golden Gate Park. It is significant that this first application of such an important technology in San Francisco occurred on such an awkward and indirect route, one which contributed to the financial instability of this company. By 1890, San Francisco already had a large system. The plethora of horse, cable and steam-powered systems occupied most of the major usable streets with their own franchises, so that the entry of new operators dictated the use of commercially less desirable streets and routings. There was a popular dislike of overhead electric lines, and the alternative underground conduit system, as used in new York and Washington, implied high capital costs. Thus, the electrification of existing modes proceeded very slowly, and at the time of the 1906 Fire, the main lines of the network were still largely cable operated. More importantly in a way, a significant institutional change was occurring. This was the consolidation of the many independent, often competing systems, into, first, the Market Street Railway Company in 1893, leaving only a few independents. Then another consolidation of this company with all but three remaining independents occurred, becoming the United Railroads in 1902, and essentially creating a citywide monopoly. Horse cars, cable cars and steam trams operated over an amazement of geographic locales, crossing, meeting, receding, shuttling, connecting and converging upon one another like dancers in a pattern of bemused complexity. They wove back and forth across each others lines in the warp and woof of a gigantic fabric; the clangor of their coming and going, ascending and descending, accelerating and retarding, rattling over cobbles, Belgian blocks, asphalt, macadam and steel switches and crossovers comprised a contrapuntal symphony of cosmopolis.